Precision. Strength. Passion. Grace. Control. Beauty. Magic. I could go on and on, yet I cannot find the perfert word to describe the Nrityagram dancers who performed tonight. Three dancers took the stage at Chowdiah Memorial Hall to perform Odissi, a classical Indian dance. 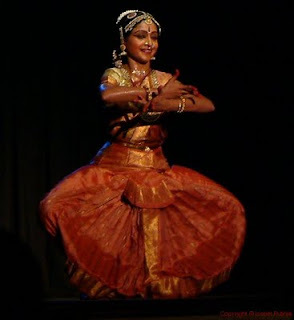 Odissi is described as "a synthesis of the ancient and exotic and modern and intellectual. Odissi creates an illusion of sculpture coming to life." These dancers captured that desciption perfectly. This dance troupe tours the world and they certainly are world class. I have never seen such precision; they are as one. The dancers live together and practice daily two hours outside of Bangalore in Nrityagram village. The public can watch most days. We plan to visit soon.